While many of our training buddies are up in Quebec running marathons and halfs, the rest of us will be here running along what used to be the Wakefield version of the Law Enforcement Half Marathon (now Boston’s Run to Remember). Water Stops: Lots of them! I need a few volunteers, or at least a car at Wakefield High and/or Lake Q and/or Nick’s Pizza. What (short): You’re running Breakheart. Main Street to Green to LynnFells Parkway to the Saugus side of Breakheart. There will be a water stop there. Do a counterclockwise loop, or clockwise if you wish. Since you’re dressed for the beach, feel free to cool off in the pond as you make you’re way around. The loop will take you back to the water stop. After that just go back the way you came to finish up your 9 miles. Note the yellow arrow won’t really be painted on the road. This will take you up to Lake Quannapowitt. There start running counter clockwise around the lake. Feel free to stop at the little beach there. I’ve never seen anyone swim in Lake Q but I’ve heard rumors that Jose has taken a swim in there during a run. In the Converse parking lot look for an MRC car for your next water stop. It may be self serve. After that stop continue around the lake by taking a left on North Ave and a left on Church Street. When you hit the church turn right onto Common and merge onto Main. Run through Wakefield Center and keep heading down Main Street. Stop at Nicks for another stop, then keep on running until you hit Brueggers. Theme : Olympic Rings. Last week we did well to show our Team USA spirit with Red, White and Blue shirts. On the last day of the Olympics let’s honor the event by wearing a running shirt that is either Blue, Yellow, Black, Green, or Red. Hopefully we get at least one of each so I can take a picture. The Route: This route will follow what was once the Melrose Law Enforcement Memorial Half Marathon, which has since become Boston’s Run to Remember. 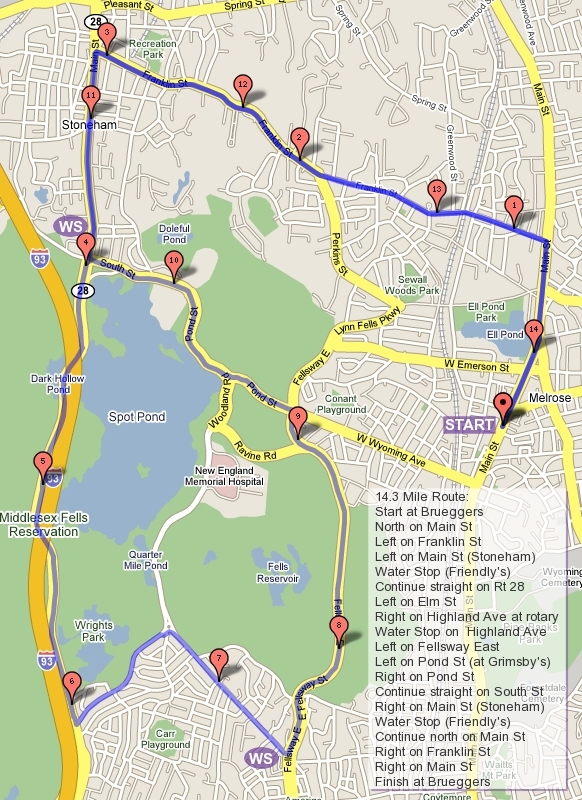 Short Route: Head up Main Street past Ell Pond, left on Melrose, left on LynnFells to Grimsby’s for a short water stop. Continue on LynnFells to the Fellsway East. Run through the hills down to the traffic circle at Highland Ave and turn right. Continue on Highland all the way up to the next water stop. After the stop run the Woodland side of the pond (keeping right at the Highland rotary). Turn right on Pond Street down to Grimsby’s and continue on to West Wyoming, down to a left on Main Street and finish up Brueggers. Long Route: Head up Main Street past Ell Pond, left on Melrose, left on LynnFells. At the set of lights after the tennis courts turn left on Tremont Street. Circle Ell Pond with a series of lefts on Lave Ave, West Emerson, Main Street, Melrose Street and back on LynnFells Parkway. This time go straight on the Lynn Fells Parkway to the water stop at Grimsby’s. Continue on LynnFells to the Fellsway East. Run through the hills down to the traffic circle at Highland Ave and turn right. Continue on Highland all the way up to the next water stop. After the stop run over to the Highland Ave rotary and go left on Elm Street. Circle Spot Pond with rights on the Fellsway West, into the parking lot at Straw Point, and onto Pond Street. Run past the Zoo and up Woodland Ave back to the Highland Rotary and back to the waterstop. After that continue on Highland and take your first left on East Border Road. Run up that road until you hit the lights. Turn left on the Fellsway East, back through the hills, past Grimsbys onto the LynnFells Parkway. After you run past Melrose High School turn right onto Melrose Street and a right on Main to finish up at Brueggers. Theme: Red, white, or blue shirts. A little patriotic support for the US Olympic team. How Much: $2 for long, $1 for short. If you find you need more than one or two Gus along these runs, please consider contributing more. Water Stops: I need a helper, preferably a car to meet me at Eugene and I’ll drop supplies there and then cover the other stops. The Route: This week we’re running my favorite training route, Winchester Highlands. It’s a tricky one so look at the map, and probably throw one in a ziplock bag and bring it with you. We’ll start heading north on Main Street, turning left onto Franklin. Franklin will take you into Stoneham, past Stoneham High School. You’ll then hit a set of lights where you turn left on Street. Follow that through Stoneham, over I93 to a water stop on Eugene Street on your left. The stop is not on the street you’re running on so look to your left after you cross over I93. Shorter route runners will head back over I93, but take a right at your first set of lights onto Park Street. This will bring you down to Friendly’s. Cross Main and continue straight past the Zoo to Pond Street, where you’ll turn left. Head down to Grimsby’s and turn left onto the LynnFells Parkway. Take that up past Melrose High School, turn right on Melrose Street, and right on Main Street, and finish up at Brueggers. Longer route runners will continue down what is now Forest Street, turning left at Highland Ave towards Winchester Hospital. Follow that up a hill and look for Reservoir Road on your left. Turn left and run on my favorite training street. Enjoy the view, ignore the hill, and eventually you’ll come back to Highland Ave, take a left and follow that to the end where you’ll find a water stop. After that go right on Rt 38. Follow that to a rotary. Follow the rotary counter clockwise and you’ll see a little side road (don’t take that) then a major Street (take that!). It has a historical sign for Simonds Farm or something like that. That keeps you on Rt38. Keep running and you’ll see a fork in the road, stay right onto Washington Street. Follow Washington to Forest Street at the Gingerbread Construction Company. Turn right onto Forest and head back up to the water stop (same as the first one). After that head back toward Stoneham, taking a right at your first set of lights on to Park Street. This will take you over by Friendly’s. Turn right at Friendly’s onto Rt28 and follow that along the back side of Spot Pond. Look Spot all the way around to Pond Street. Turn right there and head down to Grimsby’s. Continue straight down West Wyoming to a left onto Main and back to Brueggers. This week we’ll take off from Brueggers at 8AM on our way to along the LynnFells Parkway to Main Street in Saugus. Here the shorter route runners will turn down Howard Street back to Green Street in Melrose. There they’ll turn back onto the LynnFells past Melrose High School, to Grimsby’s, down Wyoming to finish up. I’d like a volunteer to do a waterstop at the knoll by the high school for the shorter route runners. The longer route runners will head to Farm Street and Wakefield High School where I’ll do a water stop. From there you’ll take a trip through Breakheart before returning to the water stop. After that stop, head to Water Street, to Wakefield Center, and then back along Main Street to Brueggers.